"Get big or get out." "You must be twice the size that you are to succeed." These are bromides that some industry talking heads might be telling you. I hear it and read it frequently. And in today's social media, non fact-based opinion society, if you say it enough, people may start to believe it. I moderated a strategic planning retreat with a bank that achieved top quartile financial performance. Their growth was solid too. Their asset size was less than $500 million. A director challenged me: Does our size matter so long as we continue to perform the way we have performed? My answer: Not really, with one exception. Trading multiples. I referenced this phenomenon in a 2013 blog post, Too Small to Succeed in Banking. In that post I opined, "As we migrate towards greater institutional ownership, stock liquidity is becoming increasingly important." What I said then likely remains true today. 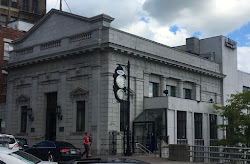 Institutional owners (funds, etc.) now own two-thirds of shares outstanding in publicly traded US banks. But why does this matter to my sub $500 million in assets bank client? So I ran some charts for you (courtesy of S&P Global Market Intelligence). 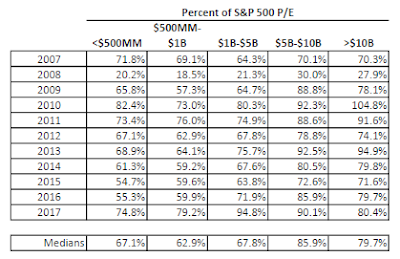 The bottom table was a bonus so readers can see that at the end of 2017 bank p/e's relative to the S&P 500 p/e surpassed their 10-year median in every asset category. Significantly so for banks $500 million to $5 billion in assets. So, on a relative basis, valuations are higher. 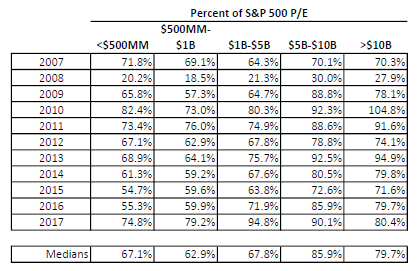 2008 was an anomaly because the S&P 500 companies traded at stratospheric p/e's because they had no "e". Back to my main point. 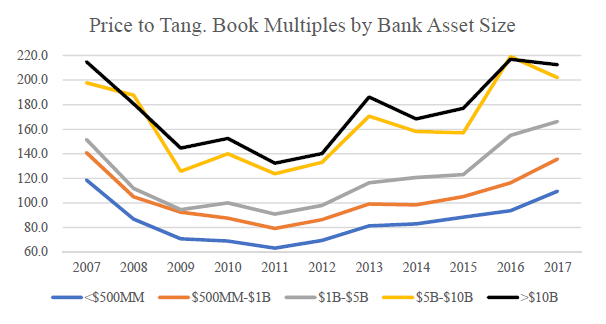 Over the past 10 years, banks that have less than $500 million in total assets have traded at lower price-to-tangible book multiples. In every year. And the differences in multiples match up nicely by asset size. The price-to-earnings chart is a little murkier based on the choppiness of earnings. However, investors tend to value smaller financial institutions more on book value than earnings. A good earner, like my client, tend to trade at relatively low p/e's because they have great earnings. Does that sound right? Earn better, and get rewarded with a lower p/e? Fair is in the eye of the beholder. If you remove nearly 2/3 of the potential shareholder base because you have little daily trading volume, then you have less buyers seeking your shares. Supply and demand. And that is where the economies of scale argument has merit. If you intend to remain independent, and continue to perform well and grow sufficiently, then you are likely delivering total returns acceptable to shareholders. Even without trading multiple expansion. But if you would like to acquire a nearby financial institution, and you are trading at lower trading multiples than other would-be acquirers, you would be at a disadvantage. Your "currency" isn't worth as much as your larger competitors. Which may also make you vulnerable to an aggressive buyer's offer to buy you, if the buyer is large and has much better trading multiples than your bank. Fortunately, unsolicited offers are not common in our cordial industry. But we shouldn't rely on it. I think you have a very valid point about not necessarily needing to get big, at least if they can cover compliance costs (including any potential listing expenses, which I've been told are significant). 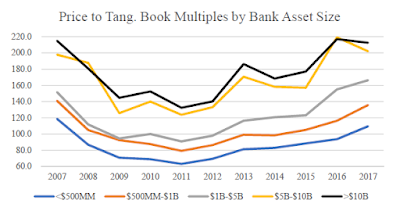 But like you point out, a higher multiple can definitely help if you are using it as currency, especially as bank M&A continues to be one the strong side. As a sidebar, I'm really curious, as to the continued impact of the new tax law on ALM. As I really don't follow the bond markets, but would have expected that between the decline in tax rate (in turn, making munis marginally less attractive, as it seems like a number of banks used them to manage their tax rates and potentially get a few more basis points out of their portfolio) and the increases in the fed rate, that there would have been a significant amount of portfolio turn over at a number of institutions. I'm also really curious as to how a number of institutions are handling the unrealized losses on investments into gov and muni bonds (though I'm not sure how it impacts the various capital ratios; as I'm aware of one local bank where their unrealized losses had grown to be about 10% of total equity within the past 12 months). There is an article in today's American Banker (see link, may require subscription) that the biggest banks dumped muni's YTD by $16 billion. I checked the AOCI (accumulated other comp income) line in the equity accounts of a $1.5 billion Pa bank and AOCI increased by $2 million 12/31 to 6/30. Haven't looked at banks in the aggregate, but it would be interesting. 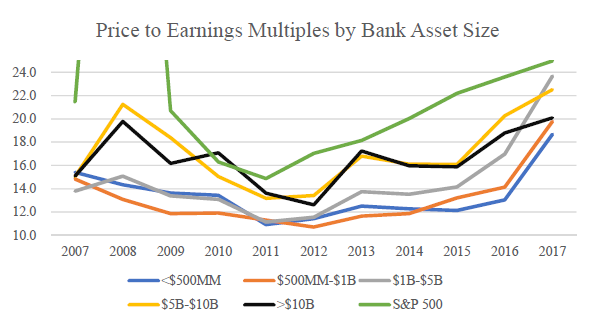 On the lower trading multiples for smaller banks, if the smaller banks are meeting shareholder total return expectations, then multiple expansion may not be necessary. Strong financial performers continue to comply with rules and regs, so compliance is already baked into their performance. I'm interested in the framing of the question, as the real question, if you are producing high returns on invested capital sub-$500MM in balance sheet size, isn't "do I HAVE to get big?" The more important question is "can I continue to acheive high returns on incremental invested capital given my market and business model and if not, can I and do I want to adjust my model or find a new/better market, or do I have to return capital via dividends or share repurchase?" Balance sheet size is basically second order and derivative of how you answer those two questions. If you have high ROE or ROIC and good reinvestment opportunities inside your model, it is a real mistake not to avoid growing as you are leaving those opportunities on the table. On the other hand, if you have low ROE or ROIC, it may come as a disappointment, but getting big or smushing together two balance sheets to achieve "scale" isn't going to solve your problem. You'll just be destroying value as you deploy more and more capital at lower and lower ROIC. I'm always impressed by small banks that show capital discipline by recognizing that the 14-16% they are doing in market X cannot be done on an incremental basis in market x (often rural banks) so they return capital. "How do I deploy the capital that shareholders entrusted to me?" is an excellent question Boards and Management Teams should ask themselves every year at strategic planning. If profitable growth isn't in the offing (long-term), then returning it is the right thing to do. For mutuals, that would be in the form of a special dividend to core depositors, in my opinion. Agreed - I don't think instinctively of the mutuals, but special dividends to the core depositors (or massive community investments or "tithing" like structures like Eastern Bank) makes sense.